I've been reading the Guardian ever since they went to full content on many of their feeds. Terrific paper, great innovation. Unfortunately, the ads associated with feed adwords can be problematic. Did I ever mention I once lived in the Bangkok's old Pradu Nam (water market)? I wonder if there's a way to specify that some adword topics should be advertising free. 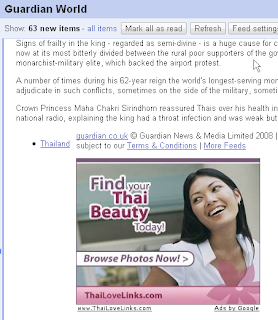 So no ads for posts on Thailand, for example.